At its Transform NYC 2017 event yesterday Lenovo mainly discussed enterprise computing. Towards the end of the show the talk turned to the history and progress of its professional laptop personal computer range. 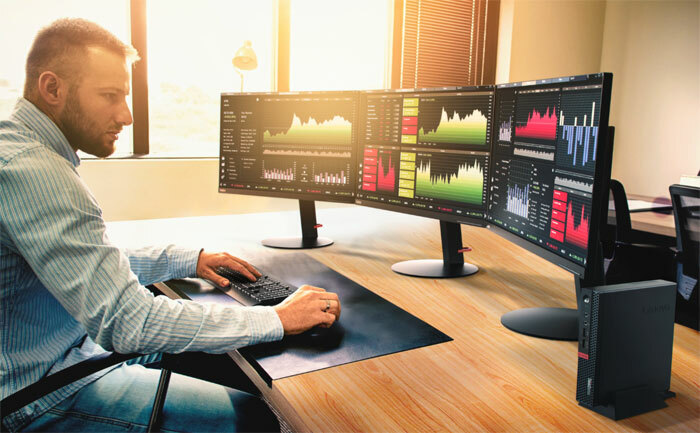 After summarising the Think range that is available now, Christian Teismann, Lenovo SVP and GM of personal computer and devices segment, introduced the ThinkStation P320 Tiny. This is yet another SFF PC that claims to offer the capabilities of a 'tower' PC system. As the ThinkPad 25th Anniversary approaches, Teismann admitted to being excited about a 'special anniversary edition' laptop with the best features of past ThinkPads infused with today's best technologies. That wasn't all though. Teismann wanted to show that Lenovo isn't just looking at incremental change. With this in mind he unveiled a concept "ThinkPad of the future" laptop as you can see pictured above and below. The concept uses advanced materials and new screen technologies to form clamshell laptop without a hinge, it just folds thanks to its flexible electronics and screen construction. Some thought seemed to have gone into this design, beyond wild imagination. The Lenovo exec talked about how users might interact with this always connected, always on device via natural speech, or handwriting, as well as traditional mouse/pointer control. Interestingly it could also respond by voice if appropriate, said Teismann. Anticipatory AI seems to be a major feature of how the device would work. As a major OEM Lenovo might have some insight to how Microsoft is developing its AI and OS for always connected devices like these. At some technology show, some company showed some concept product featuring a bendable screen… I have yet to get my hands on any product with a bendable screen. Seriously, companies keep showing these things off as the future, just around the corner, and they never materialise in the shops!! Yes, probably will materialise around the same time as Tactus displays…. wow Lenovo shows a concept laptop with a design that's basically been going round for decades… I know it was pretty common ‘idea’ at my uni when I was doing product design.